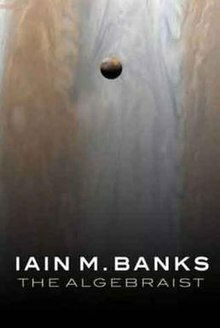 The Algebraist is a science fiction novel by Scottish writer Iain M. Banks, published in print in 2004. It was nominated for a Hugo Award for Best Novel in 2005. It was his third science fiction novel not to be based or set in The Culture, the earlier two being Against a Dark Background and Feersum Endjinn. The novel takes place in 4034. With the assistance of other species, humans have spread across the galaxy, which is largely ruled by the Mercatoria, a complex feudal hierarchy, with a religious zeal to rid the galaxy of artificial intelligences, which were blamed for a previous war. In centre-stage, Banks portrays the human Fassin Taak, a Slow Seer at the Court of the Nasqueron Dwellers. The Beyonders, a large fleet of space marauders originating on the fringes of the galaxy, have cut the system of Nasqueron's star (Ulubis) off from the rest of Mercatoria civilization by destroying its portal (the only means of faster than light travel), and the local Mercatoria adherents await the delivery of a wormhole connection from a neighboring system via sub-lightspeed travel. The Dwellers, an advanced and ancient civilisation of non-humanoids who inhabit gas giants, lead an almost anarchic existence based on kudos, and inhabit the majority of gas-giant planets in the galaxy. They are the only major species outside the control of the Mercatoria, being rumoured to possess devastating defensive weaponry. Dweller societies try not to get involved with "Quick" species, those with sentient beings who experience life at around the speed human beings experience it. Dwellers are one of the "Slow" species who experience life at a much slower rate. Dweller individuals live for millions of years, and the species has existed for billions of years, long before the foundation of the Mercatoria. Slow Seers like Taak are a dynasty of researchers who attempt to glean information from the Dwellers' vast but disorganised libraries of knowledge, artificially slowing their metabolisms to better communicate with them. Taak, looking forward to a life of quiet scholarship, is astonished to be drafted into one of the Mercatoria's religio-military orders. It turns out that in a previous research expedition to the Dweller-inhabited gas-giant Nasqueron, Taak inadvertently uncovered a book containing information about the legendary "Dweller List" of coordinates for their own private systems of wormholes. Since Dwellers are sufficiently long-lived to colonise the galaxy at sub-light speed, the very existence of such a network was considered doubtful. The Dweller List is only a list of star systems. Portals are relatively small and can be anywhere within a system so long as it is a point of zero net gravitational attraction, such as a Lagrange point. The list is useless without a certain mathematical transform needed to give the exact location of the portals. Taak must go on a further expedition to Nasqueron in order to find the Transform. A tyrannical warlord, the Archimandrite Luseferous of the Starveling Cult, in loose alliance with the Beyonders, sets out to invade the Ulubis system from the Cluster Epiphany Five Disconnect, also aiming to possess the secrets of the Dweller portals. A Mercatoria counter-attack fleet hurries to defend Ulubis against the Starveling Cult ships and their Beyonder allies. Both fleets are forced to travel at sub light speeds, leaving the inhabitants of the Ulubis system anxiously wondering which will arrive first. Taak's hunt for the Transform takes him on a journey, partly through the Dweller wormhole network. In a back story, it is revealed that he has been out of sympathy with the Mercatoria for some time, particularly over their treatment of artificial intelligences, and has in fact been a Beyonder agent. It is also revealed that the Dwellers have been harbouring artificial intelligences from Mercatoria persecution. The Beyonder/Starveling forces arrive and easily overwhelm Ulubis's native defences. They discover to their dismay that the counter-attack force is arriving much sooner than predicted, and is superior. The Beyonder factions despair of locating Taak and the secret in the time available before the recapture of Ulubis, and retreat. The Starvelings under Luseferous remain. He makes a last-ditch attempt to force the Dwellers to yield up Taak, threatening them with antimatter weapons. The Dwellers respond with devastating blows on his fleet. Luseferous flees under Mercatoria pursuit. Taak returns from his journey with his memory partly erased. He is still able to piece together the secret from the remaining clues: every massive body has a region of zero net gravitational attraction at its exact centre. The Dwellers have hidden wormhole portals in the cores of all their occupied planets, and the Transform was never necessary. It remains unclear whether the Dwellers will give the necessary cooperation in allowing other species access to their network, now that the secret is out. The novel ends with Taak, having left Ulubis and joined the Beyonders, suggesting to a lifelong friend he has just discovered is an AI, "all will be free". In an interview in 2004, Banks stated that "It probably could become a trilogy, but for now it’s a standalone novel." The Algebraist was shortlisted for the 2005 Hugo Award for Best Novel. In 2011, the novel was short-listed for the NPR Top-100 Science Fiction, Fantasy Titles. ^ "2005 Hugo Awards". The Hugo Awards. Retrieved 2014-04-29. ^ "2005 Hugo Awards". Retrieved 12 August 2011. ^ "Science Fiction And Fantasy Finalists". Retrieved 3 August 2011. This page was last edited on 10 September 2018, at 19:48 (UTC).